As with other laboratory tests, the extraction of sample material and quality of the sample taken for genetic tests are of critical importance for the successful completion of the test. An EDTA blood sample or two cheek swabs of the oral mucosa are suitable for genetic testing. EDTA blood (approx. 1 ml) is the most suitable sample material for DNA tests. It is absolutely necessary to use EDTA as an anticoagulant. Lithium heparin blood or citrated blood is not suitable, since the subsequent PCR can be disturbed. In very rare cases, transport-related factors or extreme stress during sampling can lead to no result being obtained. The proportion of blood samples that cannot be evaluated is very low, at <1%. Cheek swabs are only well suited sample material for genetic tests if taken correctly while observing certain important rules. Correct handling is essential, since significantly less cell material is available for examination from mucosal swabs. It is not always possible to isolate sufficient DNA material from a cheek swab. The proportion of cheek swab samples for which no test result can be obtained due to inadequate swab quality will vary depending on the DNA test performed. On average, this occurs in roughly 5% of samples. Please always take two swabs per animal. 1.) 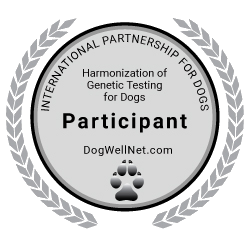 To prevent the swab from being contaminated with foreign DNA, the animal should not have eaten or nursed for roughly 1–2 hours before taking the swab. It is also advisable to keep the animal separate from other animals of the same or different species during this period. 2.) When collecting the swab, rub the inside of the cheek vigorously in order to obtain enough cells from the buccal mucosa on the swab. Genetic testing can only be successfully conducted if enough cell material adheres to the swab. Saliva alone is not generally sufficient for the test. However, there should not be any blood on the swabs. 3.) Allow the swabs to dry for at least 2–4 hours. The swabs can be placed in the tube for this. The tube should not be tightly sealed, however. The tubes with the swabs or the EDTA blood samples should be labelled with a printed barcode. For horses: The alternative to a blood sample are 10 - 20 mane or tail hairs. When pulling the hairs, please make sure to get the hair roots, as those are important for the testing procedure. If you send in a sample of a foal, it is recommended to use tail hairs, since the mane hairs could be contaminated with DNA from the mother's mare in rare cases.